When was the book of Jude written? Jude is addressing his letter to unbelievers. "...not '___' faith that was delivered but '___' faith that was delivered..."
The Church was called "saints" after they were _______. What kind of faith did the saints have? Who was in perils upon the sea and had many marks put on his body, his credentials before God, that he'd suffered for the cause that Christ died for? When Jesus said, "Go into all the world and preach the Gospel to every creature," what did He mean? If you're not borned again, you do not believe in the ________. And if you do not believe in the ________, you haven't been borned again. Some people only see _____ crosses at Golgotha. Satan is always putting a(an) _____ across the Word of God. What was the Tree of Life in the Garden of Eden? What did Abel use to lead the lamb that he was going to sacrifice? Who went down to put a curse on Israel and said, "How can I curse what God's blessed?" How could they tell that Aaron was alive when he went behind the curtain into the holiest of holies? Balaam cursed Israel instead of blessing them. Who said, "Let me die the death of the righteous, and let my last end be like his?" Who did Brother Branham use as a beautiful type of God the Father sending out the Holy Spirit for His Bride? While preaching, Brother Branham stops and comments about some men who were trying to stop the meeting. What did he say about them? 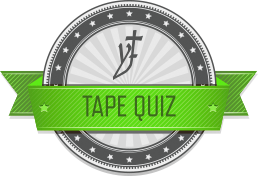 Here are the current quiz results for Earnestly Contending For The Faith That Was Once Delivered To The Saints. Anyone taking the quiz after Wednesday, May 11, 2011 will not have their score posted.